600 lens. 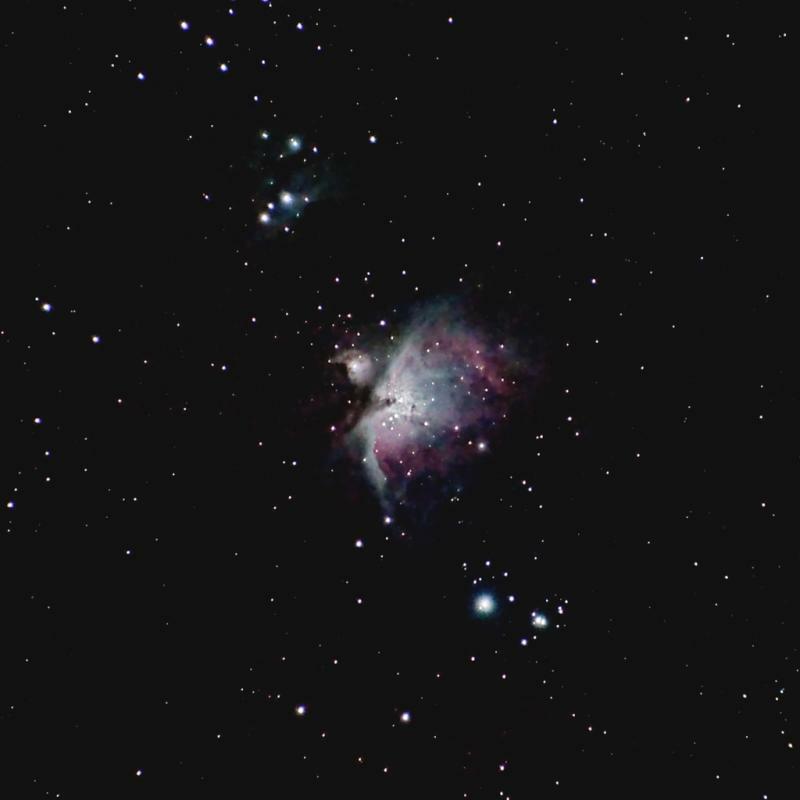 F 5 1/30” Orion Nebula. Would it be possible to take about 30 photos and get a good image? I will have darks, flats and bias as well. No tracker yet:( . Should I take more lights? If we ever get a cloudless night lol. You may have other reasons for the 1/30 second, but I think you might be able to go 1/2 second at 600mm with minimal star trails. I doubt you will get much at all at 1/30 second. Won't hurt to try though. The max time for 'pin-point' stars is 0.49 seconds - D5300, F/5 and 600mm. Per Android Pin Point Stars app. What ISO will be using? Take as many Light subs as you can and stack them with DSS. Edited by Jim Waters, 13 February 2019 - 11:18 PM. I’m going to try .50 at iso 1600. I have tried it before and got trails. If its really clear I would like to try .30 at 800. I have a Bahintov mask. I assume its actually 0.49 sec and not 60x0.49=29.4 sec. Shoot some test shots at different speeds. Get back to us with the results. Edited by Jim Waters, 14 February 2019 - 12:00 AM. With a modern CMOS DSLR you want to use an exposure time of not longer than 100 / f.l. if you really want very little to no trailing (at all). Of course, if you view the result at some smaller scale then you can expose longer and it will depend upon where in the sky you are imaging. When imaging closer to one of the celestial poles you can expose for a longer period of time (potentially significantly longer, say 2X or more depending upon your field of view). So, using the above "rule of 100" and with a 600mm focal length your maximum exposure comes out to 100 / 600 = 1/6s ≈ 1/4s (close enough). However, if you are imaging near to the celestial equator (zero degrees declination) with a camera that has relatively small pixels and you can't have ANY indication of trailing then you may want to use a "rule of 50." Here is an image of the Orion Nebula that I took seven years ago using a 300mm telephoto lens on a fixed tripod using a stack of 512 images that were each exposed for 1/3s (ISO 3200, f/5.6). I wouldn't call this "good" but you can certainly see the major features and even some of the Running Man Nebula. In any case, be careful of the total count of pictures taken with your DSLR, the focal plane shutter has a limited life span, maybe several hundred thousand activations which can go pretty fast if you are taking thousands of images each night. Edited by james7ca, 14 February 2019 - 03:34 AM. Determine what is the longest exposure that gives trailing short enough to satisfy yourself, at the image presentation size you are aiming for. Shoot as many subs as you can squeeze into the night(s) and your sky window (before Orion slips behind trees, etc.